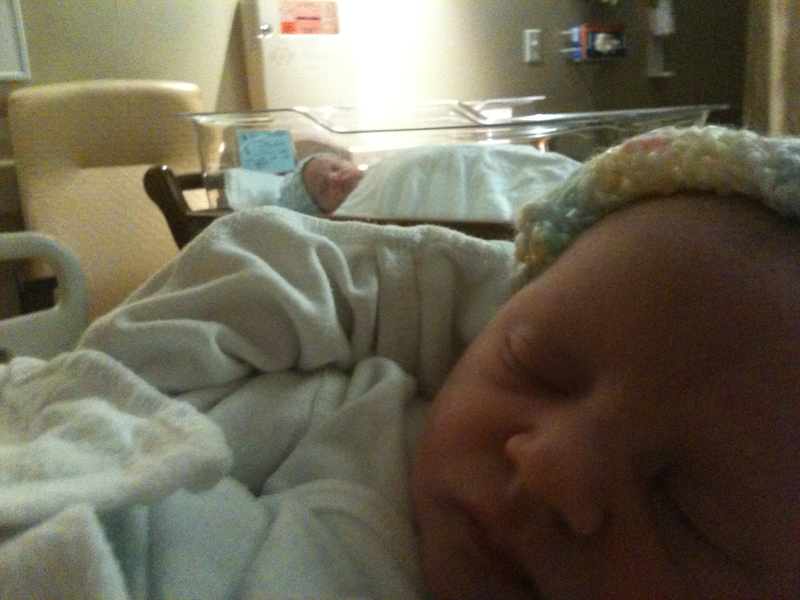 One year ago today, Henry and Eleanor were born. Before they were born, they were Baby A and Baby B, and once they were born they became Baby Boy Ring and Baby Girl Ring. The first hours on the outside. We couldn’t believe it when, three days later, the hospital sent us home with them. By ourselves! We needed help strapping them into their car seats. They were so small! 5lbs 11oz and 6lbs 7oz. Born at 38 weeks exactly, they were not pre-term or pre-mature. A due date is plus or minus two weeks (not to horrify the pregnant among us), so they were technically on time. We planned for them. A week before, we knew the target date for the induction. At my doctor’s office (where my midwife is, too), they won’t allow a twin pregnancy go beyond 39 weeks, because of complications that can arise from attempting to deliver two babies of relatively full-size. Because I had PUPPS, a rare pregnancy rash that seems to mostly affect mamas with boys who are pregnant for the first time, and was utterly miserable, my midwife suggested at my final scheduled exam that I schedule the induction for the following Tuesday. The doctor didn’t want me to go into labor myself, I suspect in part so that he could schedule the birth better for him, so I snuck into the office the day before the birth, Halloween, so my midwife could strip my membranes. Later that night, I went trick-or-treating with my friend and her young family. Despite my best efforts to encourage the babies to exit, they stayed put. Baby A, Henry, had his head as low as he could go, and I was two centimeters dilated for several weeks. We woke up at 7am Tuesday, November 1, 2011 and headed to the hospital, which is about a mile away as the crow flies; less than two miles by car. Despite pre-registering, so that I would be able to go straight to a prepared room and relax (I guess), I spent more than an hour filling out paperwork. That day they had switched computer systems, and the entire hospital was learning how to use the new system. It was almost comical. After the paperwork was filled out and I was cleared to go up to my room, I was given a wheelchair and a docent and wheeled up while Bob trailed alongside. We were the only people who gave birth that day in Olean, and we had most of the floor to ourselves. Like Beyonce. Some other families moved out while we were there, so the nursery was still pleasingly busy. I was hooked up to an IV of saline and pitocin, which stimulates labor. Both babies’ heartbeats were being tracked via garage door clickers (as far as I could tell) that were strapped around my belly. Because Henry had put himself into position (basically from 28 weeks onward), they were stacked, with Henry closest to my spine and Eleanor against the outside of my belly. It was difficult to keep Henry on the heart rate monitor, because he was essentially buried. They wanted to track both babies the entire induction, because if labor set in quickly and a baby had a cord around his or her neck, the contractions could cause serious damage, and I’d end up with a cesarean. So Henry blinking in and out of existence was disconcerting. They started the pitocin at the lowest possible dose, around 8:30 in the morning. An hour later, they upped it. A half hour later, with still nothing happening, they upped it again. The doctor showed up and decided to monitor Henry via a probe in his scalp. So he broke Henry’s amniotic sac and screwed the probe into his scalp. He still has a faint, white dot marking the spot, towards the back of his head. This is when labor hit. After a few hours of unceasing contractions, fed by the pitocin, I felt exhausted already and roughened by the pain. I thought that even if I was able to push one baby out, the way I was feeling I’d never be able to do two. So I opted for an epidural. Within an hour, I went from 7 cm to 10 cm. Henry was born at 4:03 PM, weighing 6lbs 7oz, and Eleanor followed at 4:15 PM, weighing 5lbs 11oz. We spoke with the nurses when we checked in, and throughout the labor, and asked that both babies be left with us for the allotted hour, before getting their eyes washed and whisked off to the nursery. Nonetheless, while Eleanor was having her post-birth exam, Bob was searching for Henry (whose bassinet was out in the hall, because of the lack of space in the delivery room), and got out the door in time to hear a nurse on the new shift say “I don’t care, I’m cleaning his eyes now” and then proceeded to do so. Both babies were brought back to us, and we cuddled and spent more than two hours with them, before the nurses returned to take them to the nursery. We moved down the hall to the recovery room and ate, then asked for the babies to come back to us. And that was the beginning. Wait wait. wasn’t there like a spectacularly hot friend there to help? I didn’t want to scare people off with how unimaginably attractive this woman is. It would literally scare the bejesus out of people. But yes, since you’ve brought it up, I did happen to have a cat doula there. Couldn’t have gotten through it without her.